Once again, 3rd Battalion, 6th Marines, is coming home from Marjah. The infantry battalion will return to Camp Lejeune, N.C., over the next few days, with 2nd Battalion, 9th Marines, taking over for the unit in Afghanistan. India Company 3/6, which I embedded with in 2010, arrives today, Marines in the unit said. 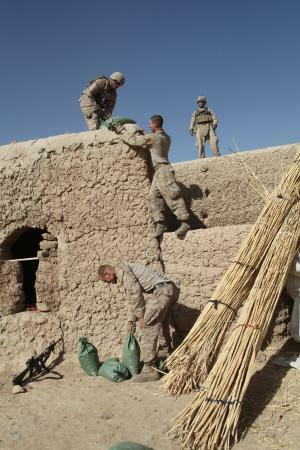 It was a dramatically different deployment for the battalion, which also patrolled Marjah in 2010, when it was one of the most violent areas in southern Afghanistan. Rather than facing daily firefights, the Marines provided security and mentoring as civil development grew. Marines with 3/6 were assisted in the Marjah area this summer by Charlie Company, 1st Battalion, 6th Marines, which was attached to 3/6 while other 1/6 forces deployed to Sangin district to the north. Their deployment is also coming to a close soon, according to this Marine Corps news release. Despite the drumbeat of good news out of Marjah, there were trying times this summer. In one example, Charlie Company 1/6 Marines reportedly found about 16 improvised explosive devices while clearing a road known as Route Alligator. Second Battalion, 9th Marines, is no stranger to Marjah, either. As I covered here, the unit replaced 3/6 in theater in August 2010, and faced fierce resistance from the insurgency through the end of that year. OOH-RAH 3/6!!! Glad to have you home again and this brings my total of sons in Afghanistan down to one!